The front of the case has support for dual 140mm fans. You can easily install a 240mm based all in one cooler as well in the front. An ATX motherboard and a reference GTX 1080 look great in the case. The overall proportions of the case allow standard hardware to fill up the case easily. As you can see in the image above, there is ample amount of room for an even longer GPU like the Asus Strix or MSI Twin Frozr GPUs. Having the PSU chamber part of the exterior of the case allows for some really clean cable runs as well. For those who do not plan to use a 3.5″ HDD, I recommend that you take out the HDD cage and use that space to help you better route the cables. 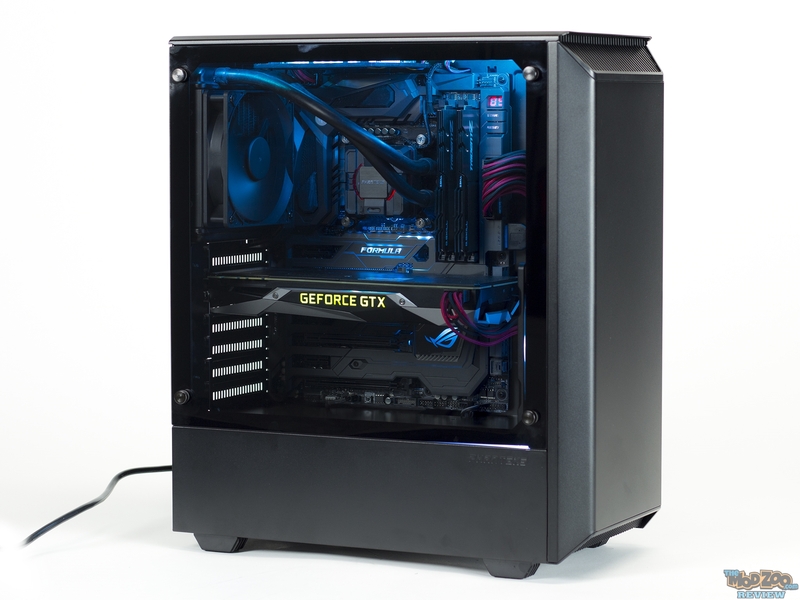 For a smaller mid tower case, cable management is exceptionally easy in the P300. Please keep in mind that using a full-size ATX PSU like a Corsair AX1200i will not allow you to install any HDDs in the bottom as the PSU and cables will come in the way. Given the smaller size of the P300, the top 140mm fan mount might not allow you to install a 140mm fan depending on the location of the CPU/EPS power on your motherboard. On the Asus Z170 Maximus Formula motherboard the 8 PIN EPS power cable location does not allow for a 140mm fan to be mounted without sanding a little bit of the fan corner off. A 120mm fan should not be an issue at all. For this build, I opted to go with a 120mm all in one CPU cooler. The back of the case allows for enough space for you to mount a 120 AIO of your choice and stick a Phanteks case badge on the block to make it fit better… You can install a 240mm based AIO in the front, but I did not like the way the tubes landed on my Corsair H100i so I opted to sacrifice cooling performance for a cleaner looking build. The built-in RGB controller not only controls the color on the power switch and the light strip in the front bottom of the case, it also can be used to control other Phanteks RGB accessories like LED strips or the new Halos fan rings. The P300 DOES NOT come with any Halos fan rings, but I wanted to add one in the front as it gives the inside of the case some color without compromising on the kind of fan I want to use. I wanted to take a picture from the back side of the case to show how the lack of grommets and the design hide the cable routing holes really well. As you can see, you can barely see the cable routing holes in the image above. The clean and simple layout of the case allows for one of the easiest building experiences I have ever had till date in a case this size. There are no cramped corners in the case, and I did not have to fight to route any cable in this build. PS: Yes, I will get some cable combs to make those cables look better. Fans – Phanteks 120mm and 140mm fans.